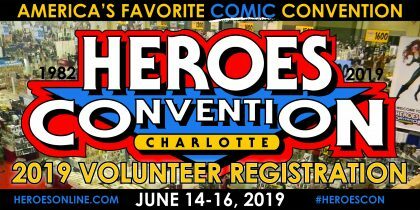 HeroesCon 2019 is just around the corner, and our small, hardworking staff couldn’t pull it off each year without the help of our great volunteers. Now’s your opportunity to be a part of America’s Favorite COMIC Convention. Hit the link and sign up today! HEROESCON 2019 :: 3RD ROUND GUEST ANNOUNCEMENTS!! MORE GUEST ANNOUNCEMENTS TO COME!! STAY TUNED!! WAREHOUSE SALE Part II :: SHELTON’S YARD SALE :: THIS WEEKEND!!! HEROES WAREHOUSE SALE (part II)! Thanks to all who joined us for last weekend’s Heroes Warehouse Sale! We appreciate all of you who fought the heat (some of you for hours on end!) to dig through our sale stocks. We know many of you were traveling for the holiday and couldn’t make it. While we hope you enjoyed the holiday, we also feel bad that some of you missed out on the sale, so we decided to throw a sequel of sorts – this very weekend! 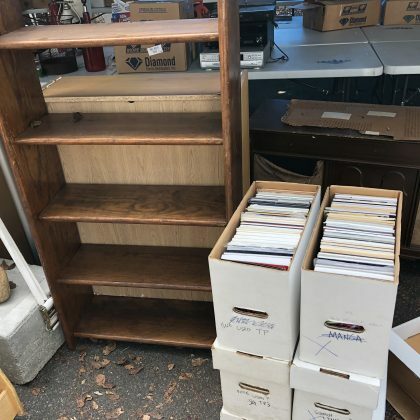 While there will be a few comics and trade paperbacks to dig through, there will be many other kinds of things to shop for, including furniture, art, frames and framed art, toys, glassware and mugs, bookshelves, dishes, lamps, dvds knicks and knacks, and much more! 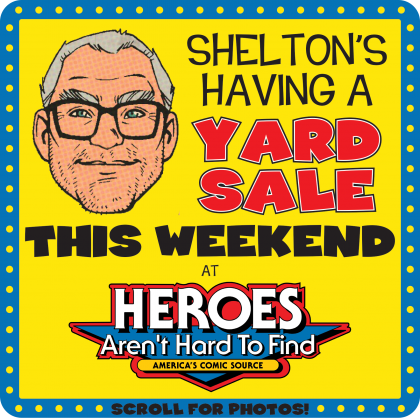 Join us this Saturday from ‘very early’ to ‘very late’ and Sunday from ‘pretty early’ to ‘kinda late’ for Shelton’s Yard Sale/Heroes Warehouse Sale (part II)! Like last weekend, this sale will take place under a big tent behind our shop. 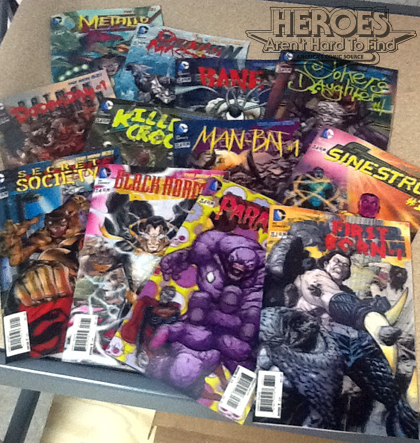 Come pick through some of Shelton’s non-comic collections and take advantage of some crazy deals. 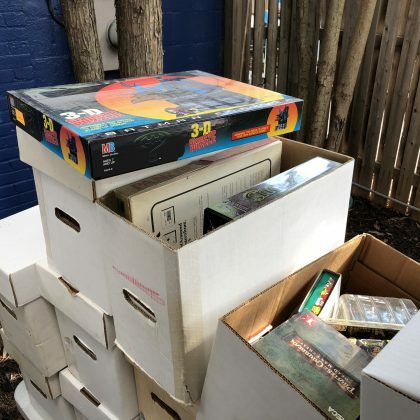 In doing so, you’ll also be helping us make room for even more comics in our new warehouse! Anyone who makes a purchase from the yard sale will get a coupon for an immediate discount on any same day in-store purchase you make. Non-reserve customers will get 10% off any new comic or trade paperback purchases, and reserve customers will get 25% off all new comics and trade paperback purchases if everything is purchased from your reserve bag. This is a great opportunity to clear out your reserve bag for an extra discount! Consider this the first of many Pop Up sales we hope to offer our customers. Make sure you sign up for our weekly newsletters and follow us on Facebook, Instagram and Twitter. You never know when our next pop up sale will be announced! HEROES DISCUSSION GROUP RETURNS THIS SATURDAY! Ever finish a comic and wish there was someone to discuss it with? Now’s your opportunity, as we bring back an old Heroes favorite during this weekend’s Labor Day sale. Join us this Saturday, September 1 at 2:00 P.M. for a brand new chapter of the Heroes Discussion Group! 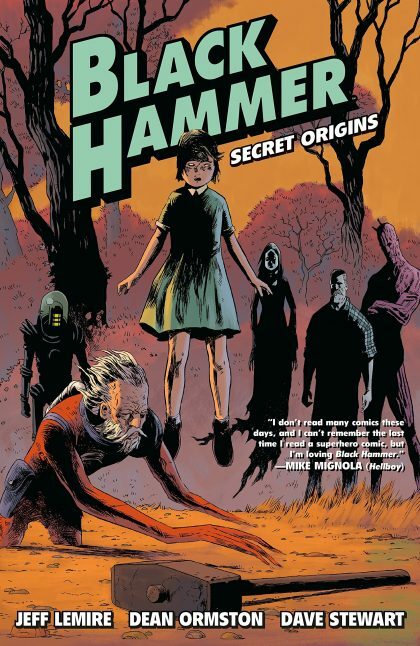 After much deliberation over what book to discuss, we settled on a favorite of both our staff and customers: Black Hammer volume 1: Secret Origins. If you enjoyed the first volume of Jeff Lemire and Dean Ormston’s breakout superhero mystery, then be sure to stop on by the shop this Saturday for a lively discussion about legacy, rebirth, discovery and much more. This time around, the discussions will be jointly led by veteran discusser Andy Mansell and our well-read young staffer Samuel M. Reynolds-Oosting. We couldn’t be more excited to share conversation about some of our shop’s favorite authors and illustrators with fellow customers and readers! It’s always a great part of our local comics community, and we hope you’ll join us for this discussion and some of the other exciting ones we’ll be announcing soon! 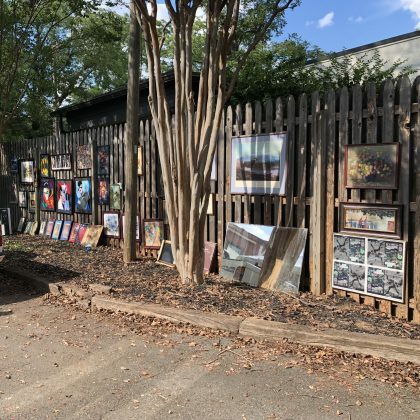 Don’t forget, the discussion starts this Saturday at 2 P.M., but the Labor Day sale kicks off at 10 A.M. and runs all the way until 10 P.M. on Saturday, with Sunday and Monday’s hours both being 10 A.M. – 6 P.M.
We have some great updates about our signing with Jason Latour and Jason Aaron THIS SATURDAY! Coach Boss is sending his buddies from Smoke and Go Catering Services to our signing on Saturday so come hungry and bring your wallets for BBQ. 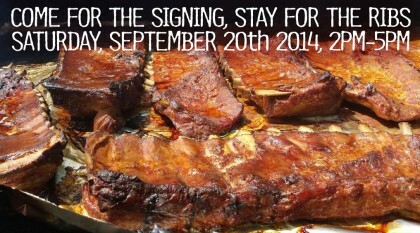 They will have ribs, pulled pork, smoked chicken and hot dogs. The SAAA-WEET TEA is on us. 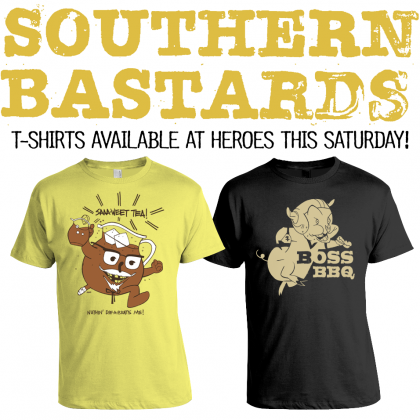 Also, the Jasons will be bringing some Southern Bastards t-shirts with them! Before Saturday these were only available at SDCC! See y’all Saturday 2-5PM and we may have even more surprises in store. Don’t miss out! Along with the opening week of the Football season and the beginning of the new school term, each year September also brings us Banned Book Week. It is an annual reminder of our freedom to read. “This year we spotlight graphic novels because, despite their serious literary merit and popularity as a genre, they are often subject to censorship,” said Judith Platt, chair of the Banned Books Week National Committee. Seth will join UNCC Professors Robert Campbell (Graphic Design) and Dr. Erik Waterkotte (Print Media) to discuss the importance of comics and graphic novels and how they are susceptible to censorship. Audience: Adults, Teens (12-18) 9/18/2014 at 6:00 PM: Morrison Regional near South Park. Andy will lead discussions at the following branches on why comics are particularly vulnerable to challenges and focus on some of the more frequently challenged titles. We hope to see you there and remember, reading is one of our greatest gifts. Never take it for granted! HEROES LABOR DAY SALE THIS SUNDAY AND MONDAY! Just a reminder that we’ll be hosting our big Labor Day Sale this Sunday and Monday! Remember that we’ll be opening three hours early on Sunday (at 10 am) to accommodate early bird shoppers, and will be open until our regular Sunday time of 6 pm. We’ll open again at our normal Monday hour of 10 am, with the sale lasting until 6 pm that night. Select statues will be marked down to rock bottom close-out prices, and will not be eligible for the discount tier above. If you’ve had your eye on any statues in recent months, this is the weekend to buy them. It’s rare for us to have a statue sale of this scale, and there won’t be another one like this any time soon, so take advantage of the sales while you can! We’ll also be offering big discounts on toys, and the statue discount tier also applies to our entire selection of manga. However, if you buy 10 or more manga selections, you’ll get 50% off those books! Dang! Demand is far outstripping supply, especially now that everyone and their mother wants some sweet, sweet lenticular goodness. This event has been in the making for a while, and savvy customers were already logging their requests as early as late June. We must repeat: as always, orders will be filled in the order in which they were received, while supplies last. We cannot guarantee we will be able to fill every request we’ve received. This might sound unfair, but it is the nature of big bandwagon events where demand outnumbers supply. However, this is a perfect opportunity to remind everyone about Previews, the catalogue that Diamond Comic Distributors publishes on a monthly basis. This catalogue advertises product three months in advance, is available to the public, and is the exact same resource Heroes uses to stock its shelves. Previews is available to you every single month, and we are happy to order anything (within reason) you’d like to purchase, even products we might not opt to stock in the store itself. This is the best way to ensure you get any items you want or need. Again, we understand the frustration, and even empathize. It hasn’t been easy for us, either! But also, isn’t this part of the fun of collecting? Do we want everything in a nice, neat package, simply for convenience sake? The hunt is part of the fun! For those of you who might scoff at that last statement, DC is also offering a complete box set of second printings of the villains books, complete with 3D covers, that will be available in February 2014. And we will have the standard, 2D editions of all the villains issues on hand in the coming weeks, as well. Thanks again for your business and your patience, and we will see you soon! HEROES ANNOUNCES JUSTIN CROUSE AS STORE MANAGER! Heroes is proud to welcome Justin Crouse to the position of Store Manager! Justin has been a valuable staff member for the past three years. Like many employees over the years, Justin was a customer for some fifteen years before he worked his way up from HeroesCon volunteer to full fledged staff member. 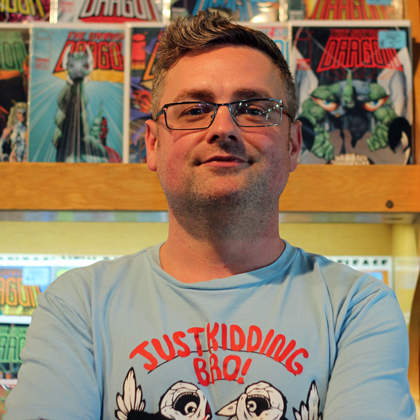 In addition to being an endless source of humor for staff and customers alike, Justin has a wide range of comic tastes – his favorites include Howard the Duck, Savage Dragon, Bulletproof Coffin, Captain America, Asterios Polyp and Black Hole. Justin’s also a talented artist, with his work appearing in several anthologies and self-published comics in recent years. He values the aesthetics of the form, and, like the rest of us, unabashedly loves comics. As store manager, Justin will handle all comic ordering, which means if you have any requests for specific items or variants, or would like to change your Previews orders, you’ll need to contact him at justin@heroesonline.com. 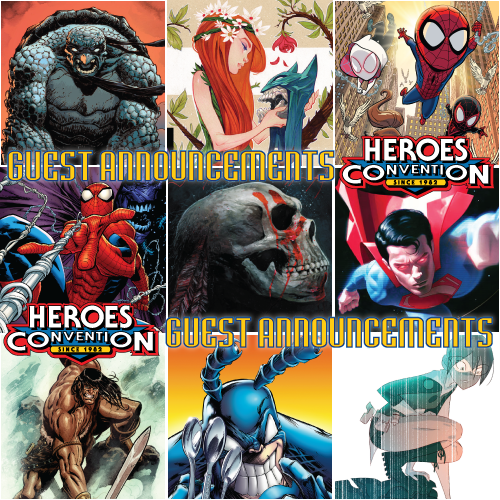 He will also be helping to coordinate volunteers for HeroesCon 2014. We are very excited to have Justin as our new store manager, and hope you’ll also welcome him. 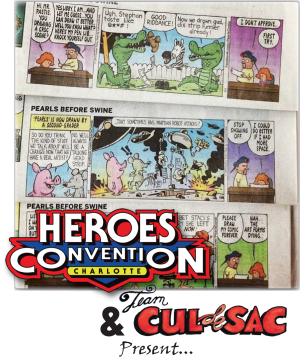 After the success of this year’s HeroesCon, we’re all reinvigorated and ready to bring you an even better comic shop and convention in the coming year. Great things are happening at Heroes, and we hope you’ll continue to join us along the way.